This is a very nice and quirky set of 5 different 19th century salesman sample glasses. One is a beautiful violet color with swirls in it. 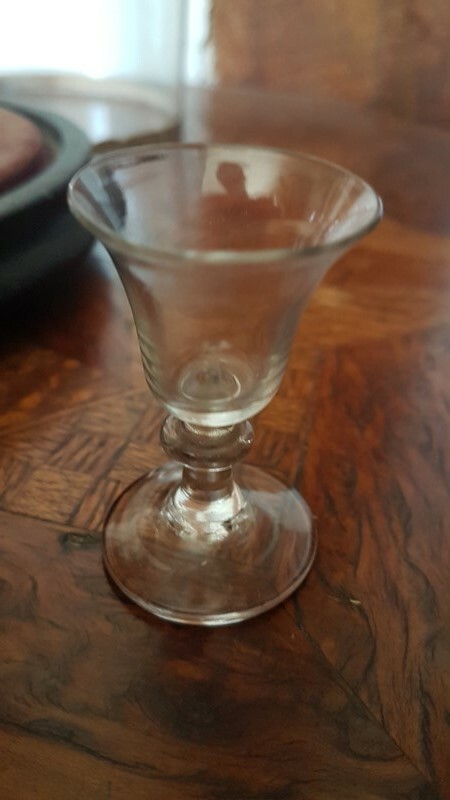 There is another that has grapes etched on it, one of a small tumbler (this one has a few small chips) the other two are goblet forms with ringed columns. The glass dome is in good conditions with the base in the original ebonized finish. The glasses range in height from 4cm to 7cm. They all have a charming slump in the glass which only comes with handblown items. Heirlooms by Lawrence specialises in unusual, decorative antiques and natural history items with a focus on function and quality. It is run by husband and wife duo Lawrence & Katja. Lawrence has grown up in the antiques trade with over 25 years of experience operating in both hemispheres of the globe. Katja is relatively new to the industry and brings an interesting and fresh eye to choosing stock. They do not buy anything that they themselves would not be happy to have in their own home. They are based in Bodicote nr. Banbury. Approx. 10 minutes from junction 10 on the M40, they are in their studio most weekdays 9 till 5 but stock viewing is by appointment."